Mixed reaction to President Donald Trump's condemnation of pro football players who knelt during the National Anthem continued Monday — as did the protests that triggered his comments. 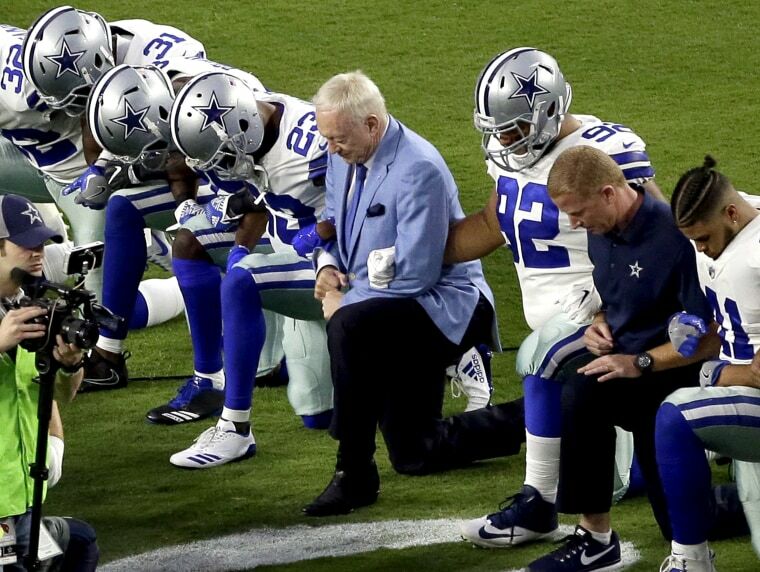 In a scene that football fans became more than familiar with over the weekend, the Dallas Cowboys took a knee before the anthem on Monday night — with their owner, Jerry Jones, among them. Their opponents, the Arizona Cardinals, displayed what the stadium announcer in Glendale, Arizona, described as a "sign of unity" — the team standing arm in arm with members of the military. Related: Was Jordin Sparks Sending Trump a Message at Cowboys-Cardinals Game? It was a reprisal of what many players and coaches and some owners offered during weekend games in defiance of Trump's comments: linked arms, players taking a knee, some teams even refusing to take to the field. Still, not all of the league's big names backed the show of solidarity. Pittsburgh Steelers quarterback Ben Roethlisberger — whose team mostly remained in its locker room — said the decision led to a sleepless night. "The idea was to be unified as a team when so much attention is paid to things dividing our country, but I wish we approached it differently," he said. "We did not want to appear divided on the sideline with some standing and some kneeling or sitting. "As a team, it was not a protest of the flag or the anthem," he added. "I personally don't believe the anthem is ever the time to make any type of protest." In Buffalo, a longtime stadium worker quit his job after several Bills knelt and locked arms, NBC affiliate WGRZ reported, and on MSNBC, former Seattle Seahawk and Green Beret Nate Boyer said that he, too, would always stand during the anthem "because of what it means to me personally," he said — "the men and women who laid down their lives for what that piece of cloth represents." But Boyer added: "That piece of cloth also represents everyone's right in this country and the freedoms to express yourself, how you feel. And when you are not pleased with something, in our country, you have the ability to speak out against it or to take a knee against it." Joining the chorus of support were, among others, former Chicago Bull and Charlotte Hornets owner Michael Jordan, NBA superstar LeBron James and NASCAR racer Dale Earnhardt Jr., who seemed to offer Trump the wisdom of another president. At the University of Michigan, a student took a knee at 7 a.m. ET and said he planned to stay there until the school's administration tackled its own apparent problems with racism, the university's student newspaper reported. On the floor of the House of Representatives, Rep. Sheila Jackson Lee, D-Texas, recalled Trump's description of what he said should happen to the kneeling protesters — "Get that son of a b-tch out of here," Trump said Friday — and knelt before a lectern in "their honor," she said. "You tell me which of those children's mothers is a son of a 'b,'" she said. "That is racism. You cannot deny it." And in Missouri, a photo featuring a kneeling 97-year-old World War II veteran quickly spiraled across the internet after the man's grandson posted it to Twitter. "His concern was that the president was hiding behind patriotism and the flag," said the grandson, Brennan Gilmore, 38. "To him, it's the value those symbols from the flag represent, and by suppressing those the president was undermining those core values and he didn't like it." Asked Monday whether the president's description of what should be done with those kneeling protesters went too far, White Press Secretary Sarah Huckabee Sanders said: "I think it's always appropriate for the president of the United States to defend our flag, to defend our national anthem and to defend the men and women who fought and died to defend it." Trump himself attacked CNN over a report about his chief of staff's apparent opposition to the feud. "General John Kelly totally agrees w/ my stance on NFL players and the fact that they should not be disrespecting our FLAG or GREAT COUNTRY!," he wrote on Twitter, adding that there had been a "tremendous backlash against the NFL and its players for disrespect of our Country." "Big progress being made - we love our country!” he wrote. Trump quickly deleted that tweet and reposted a revised version, writing that "we all love our country!" Trump also posted that "Ratings for NFL football are way down except before game starts, when people tune in to see whether or not our country will be disrespected!" NFL brass, meanwhile, sounded as if they couldn't have been more pleased with the movement. Citing Commissioner Roger Goodell, league spokesman Joe Lockhart said Sunday "was an important day in the NFL and, we think, a good one." There was "probably more dialogue than ever before in the last 10 to 15 years going into an NFL weekend," Lockhart said. "Players talking to coaches, coaches talking with owners, owners talking with players." There was, he added, "no grandstanding" — just "incredibly thoughtful conversation about very difficult issues."